Click on the articles to enlarge the copy to read. Optimal Performance: Terry Roach Teaches How To Take Your Body To A Higher Level. Age No Barrier For Cycling Star: Roach Returns From Injuries, Set 4 Records. Elite Cyclist: After 2 Years Of Training, Terry Roach Rolls To A National Record. 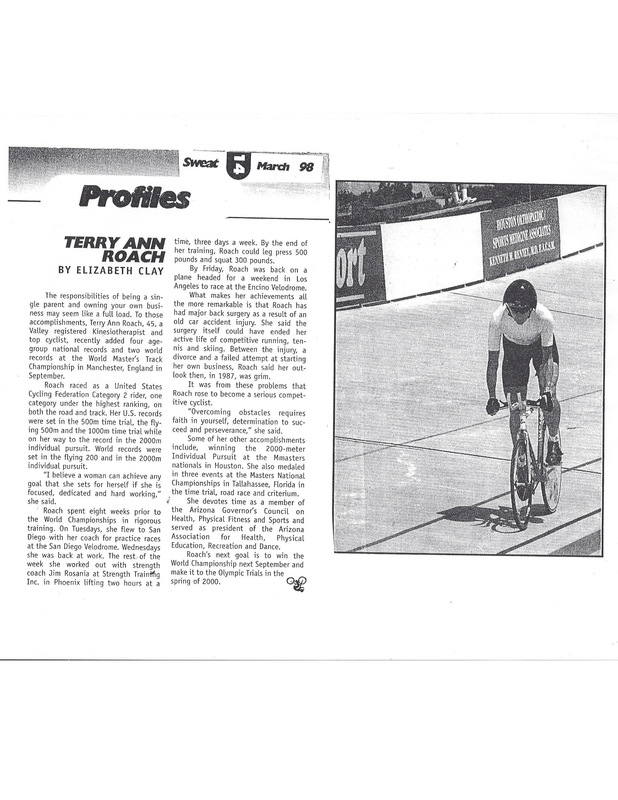 Cyclist Terry Roach rides her way to the top in only two years. After a chance meeting with her now coach John Serra, the assistant regional coach for the U.S. Cycling team, she has found success. You Go, Girl: Women Athletes Push To Succeed Despite Lack Of Encouragement. Better late than never: Cyclist Roach rides for record.